As a middle school student, the looming presence of 4 years of high school is threatening and scary: all the tall upperclassmen plowing through the hall, strenuous classes and long nights, the weight of new responsibilities and pressures. However, this frightening image no longer holds among the incoming freshmen. Thanks to Link Crew, high school can become a more welcoming place, rather than one notorious for generating stress and dread. 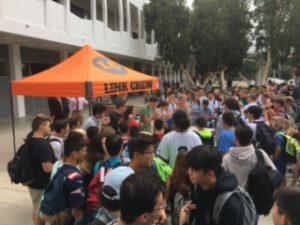 On August 8th, the freshmen class gathered before high school orientation to participate in some fun activities, which were organized by Link Crew. This was designed to ease the pressure of high school and present them with a positive outlook of their future at LCHS. Studies show that this process and experience prevents bullying in high school and generates a safe environment. “We can learn a lot from each other, and we should be a place where we support each other, regardless of grade,” Ms. Beattie said. Not only does this program affect the recipients of its mission, it also benefits the Link Crew leaders themselves. They feel empowered by giving guidance to kids and providing them with opportunities that they never had. With the pressures of high school, the importance of communication, a sense of security, and sources of counsel are key to success. It is imperative to make the freshmen, and every other student at the school, feel like they are cared for and are not abandoned in the dust in this whirlwind of new responsibilities. Together, La Canada can be a safe haven, instrumental in personal and community growth that will pave the path to a promising future and a memorable past.